Learn to analyze commercial real estate from an investment perspective with COMMERICAL REAL ESTATE ANALYSIS AND INVESTMENTS and its accompanying CD-ROM! 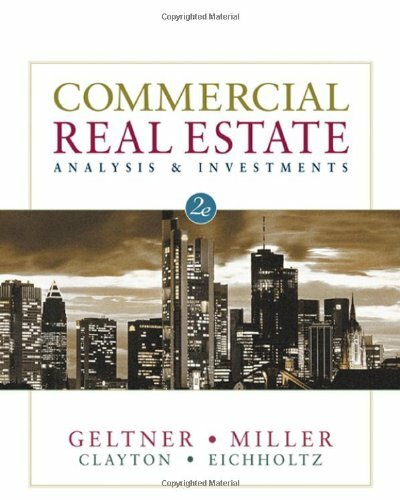 Presenting the essential concepts, principles, and tools for the analysis of commercial real estate, this real estate text provides you with the tools you need to understand real estate investments in today's dynamic economy. Studying is made easy with the CD-ROM that provides expanded coverage as well as spreadsheet examples of methodologies, data used in exhibits, lecture slide notes, and answers to study questions. If you have any questions about this product by ONCOURSE LEARNING, contact us by completing and submitting the form below. If you are looking for a specif part number, please include it with your message.